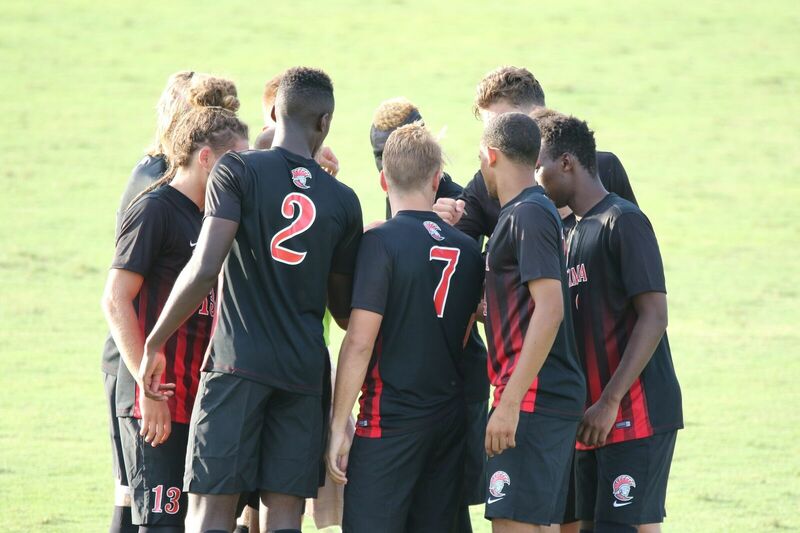 The University of Tampa men’s soccer team is looking to take the next step. In 2016, the goal will be to win the Sunshine State Conference (SSC) since they were eliminated by Rollins College in the conference semifinal last year by a final score of 3-2. In order to achieve this endeavor, they will have to face off against elite competition such as conference foe Rollins and defending conference champion St. Leo University. Senior forward Jason Collister echoes the cohesive mindset that’s been brought on by the coaching staff. “The chemistry of the whole team has been evident since day one,” Collister said. This week, the SSC released a preseason poll, ranking the Spartans fourth in the SSC going into the regular season. St. Leo is projected to win the conference as they were awarded with 60 first place votes by the SSC, followed by Lynn and Rollins with 53, and Tampa with 45. Collister again credits Bush and assistant coach Maurice Loregnard for staying on task and to not focus on the polls. “Adrian and Mo [Maurice] do a great job of keeping us focused on our performance and work ethic on the field, and not getting distracted by things such as those rankings,” Collister said. However, senior midfielder and captain Jake Winship also tends to not read into them. Thus, he doesn’t zero in on one formidable opponent in the SSC, considering the strength of the conference as a whole. “We’re not worried about anyone who we have to play, we’re just focusing on ourselves,” Winship said. Despite the fiery optimism, the Spartans will have to begin the season without one of their essential assets, junior forward Monty Berrow. “If he can play, he will; different guys have to step up,” Bush said. Berrow, who was the leading scorer for the Spartans last season, is expected to miss about six weeks with a groin injury, which is an extensive period of time, due to the Spartans regular season ending on Oct. 26. On Friday afternoon, the Spartans prevailed against the University of West Florida in their season and home opener at Naimoli Family Athletic and Intramural Complex, 4-2. The Spartans showcased their offensive prowess as they outshot West Florida 17 to 6 on the day. Two of those shots were tallied by sophomore midfielder Fredinho Mompremier, who lead the scoring charge for the Spartans. Collister and sophomore defender Ramzi Toure also found the back of the net. Even with a strong start this weekend, Collister shifts his focus to UT’s next home matchup on Friday against Clayton State. “Starting out 2-0-0 in the region is huge for us, but we know we need to complete the three-game homestand and beat Clayton State on Friday,” Collister said.